This stoic view of life extended to affairs of the heart. In Seijun Suzuki’s 「東京流れ者」 (“Tokyo Nagaremono,” “Tokyo Drifter,” 1966), Tetsuya Watari, whose character has become a hunted outcast after killing his duplicitous boss, must say farewell to his nightclub singer girlfriend, played by Chieko Matsubara. Before departing, he tells her 「流れ者に女はいらない、女がいちゃ歩けない」 (“Nagaremono ni onna wa iranai, onna ga icha arukenai“; “A drifter doesn’t need a woman. If a woman’s around he can’t walk”). Jake: The yakuza movies have great lines. 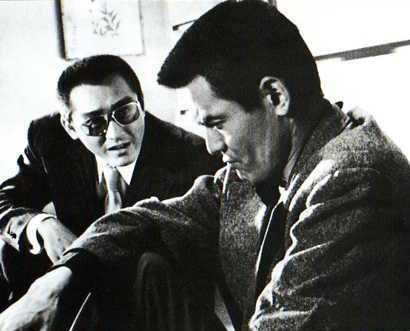 The 1970s classic, The Yakuza with Takakura Ken and Robert Mitchum, had a great tag line: “A man never forgets. A man pays his debts.” It beautifully captures the emphasis on reciprocity in yakuza society. The yakuza have some pithy words and phrases in daily life as well. 「お礼参りさせていただます」 (o-rei-mairi sasete itadakimsu-“Allow me to pay my respects.” That’s actually polite shorthand for “I’m coming to extract vengeance.” It’s so polite and yet so menacing and hard to classify as a threat. Or the famous words of one Inagawa-kai boss to his soldiers. 「浚われた時は、命がないと思え」(sarawareta toki wa, inochi ga nai to omoe) “If you get kidnapped, think of yourself as already dead.” It’s the yakuza version of “we don’t deal with terrorists” . In practical terms it meant that when one of his soldiers got kidnapped in a gang war, they wouldn’t pay ransom for him or negotiate but they’d extract three times the damage in revenge to the opposite side. Also, don’t forget to check out our growing Yakuza Dictionary, and make your own suggestions! Previous Previous post: Sumo Wrestlers Fixed Matches, But Who Gave The Orders?